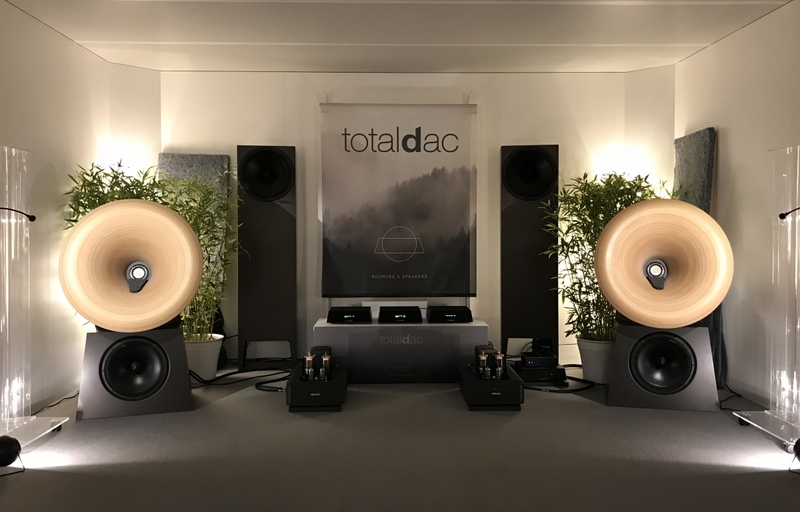 Totaldac has created its own loudspeaker to demo DACs in Totaldac auditorium and in Hifi shows. This speakers are the result of 20 years of experimentations to give a realistic and natural sound. 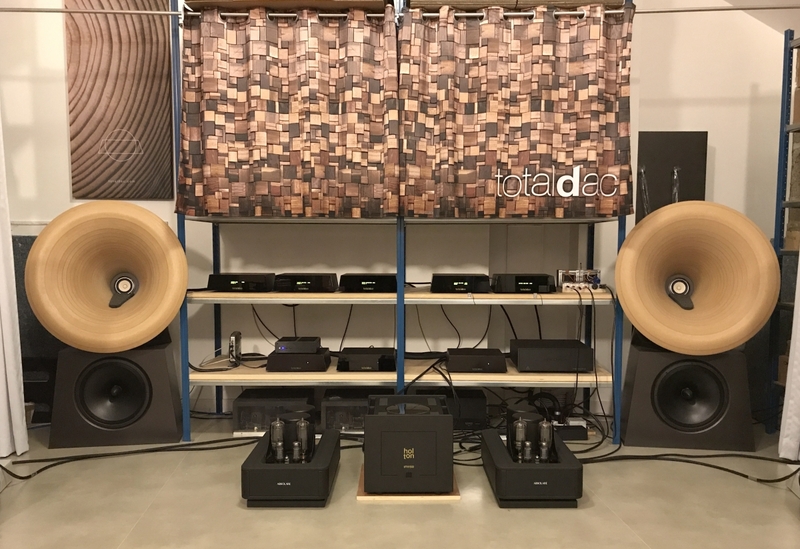 Now these speakers are also offered to Totaldac customers. 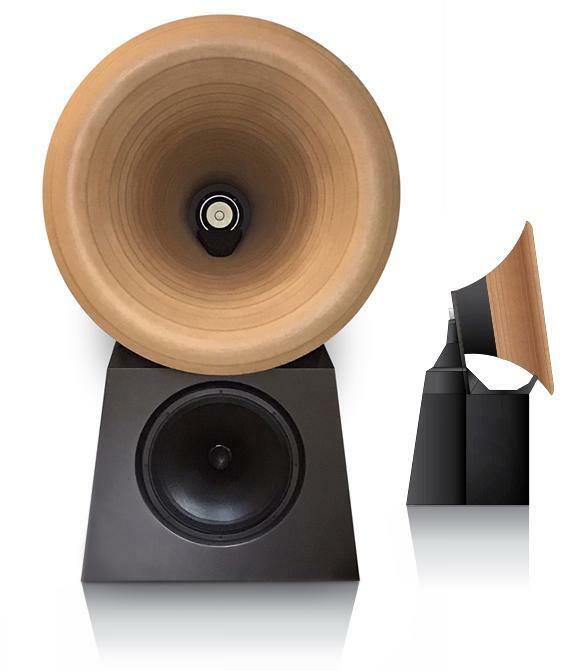 The d150 loudspeakers are high resolution, high efficiency loudspeakers based on a full range driver whose low mid frequencies only are loaded by a large round horn made of 100mm thick wood. The bass is also a high efficiency driver, thus making a real high efficiency speaker from the bottom to the top of the spectrum. The bass cabinet and the horn are both driven by your amplifier, without the help of an internal (low end) amplifier. An exceptional subwoofer is also offered as an option. "I was impressed by both of them. The d150's sound was relaxed very wide open and delightfully coherent. which is crossed over to a 15" bass driver at 150Hz. I was immediately impressed by how smooth, vivid, and 3-dimensional the sound was. -150Hz crossover frequency making the speaker close to point source. -860mm diameter wooden horn made of 100m thick wood. -15inch bass driver, 98dB/1W/1m efficiency. -selected drivers allow gentle crossover slope to get the smallest phase shift and allow to use very high quality filter components. -use of single cone for the most natural sound. -8.1ohm minimum impedance, to be used with all kind of amplifiers, from triodes to the biggest transistors. -dimensions: 1.42m heigh, 0.86m diameter round horn, 0.59m max depth . -weight: 130kg in two parts (bass enclosure and horn). An optional subwoofer can be provided to reinforce the sub bass. This 98dB/1W/1m sensitivity driver guarantees a good match with the d150 speakers. The shape is tall with a small footprint on the floor to give a maximum volume but easy to fit in any room. One single subwoofer in mono configuration or two subwoofers in mono or stereo configuration are possible. No amplifier is embedded in the subwoofer, you can select the real high end amplifier of your choice and the subwoofer filter is already embedded in the d150 loudspeaker. -filter embedded in the d150 speaker. -dimensions: 0.48m wide , 0.29m deep, 1.9m heigh.